In the Western Rite on Maundy Thursday, the priest consecrates a second Host, to be consumed during the Presanctified Liturgy of Good Friday. He then processes with the presanctified Eucharist from the altar to a side chapel and "buries" It. Upon arriving at the altar, the priest and servers kneel in adoration (as did the people as It passed in procession). In the Byzantine Rite, on the Great Vespers service of Holy Friday ("Good Friday" in the West), the priest removes the icon of Christ affixed to the Crucifix and "buries" it. 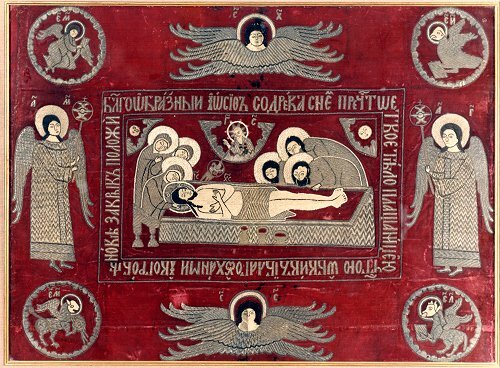 He and the clergy process around the church with the epitaphios (a cloth with the icon of Christ being prepared for burial), then places it and the Gospel (cross-side up) on a bier. The people often kneel as it passes. Then the clergy and people kneel and venerate the epitaphios and Gospel. On Good Friday, in the Western Rite of the Orthodox Church, the people pray the Great Intercessions, so reminiscent of the Byzantine litanies. The priest then unveils the Cross, as the people kneel. As the Reproaches (Improperia) are sung, the clergy and people then prostrate and adore the Cross. In the Byzantine Rite, in Orthros of Holy Friday (anticipated on the evening of Holy/Maundy Thursday; this service is also known as the "12 Passion Gospels"), the priest processes with the Cross about the church, as the people kneel. The clergy then prostrate and adore the cross. The Byzantine Prokeimenon (Tone 4) before the 7th Gospel, during this service celebrated on Maundy Thursday evening, is: "They parted my garments among them, and upon my vesture they cast lots." This is the same verse the priest chants in the Western Rite on Maundy Thursday before the stripping of the altar. Today the Jews nail on the Cross Him Who did cleave the sea with a rod, and made them to pass through the wilderness. Today they pierce with a spear the side of Him Who scourged Egypt with curses for their sake; and will give Him bitterness to drink who rained down manna for their nourishment. Why doth the law-transgressing people of false worship meditate in falsehood? Why was he condemned to death Who is the life of all? (Stichera Verse, Tone 2, Great Vespers of Holy Friday.) O My people, what have I done to thee? Or wherein have I afflicted thee? Answer Me. Because I led thee out of the land of Egypt, thou hast prepared a Cross for thy Savior. Say ye, O transgressors of the law, what heard ye from our Saviour? Is it not that He appointed a law and the teachings of the Prophets? How then did ye think to deliver to Pilate the Word, God of God, and the Deliverer of our souls? Thus saith the Lord to the Jews: My people, what have I done unto Thee, and wherewith have I harmed Thee? Thy blind have I lighted; thy lepers have I cleansed, and the man on his couch have I raised. Oh, how the assembly of the law-transgressors condemned to death the King of creation, not being ashamed nor abashed by His benevolences, of which He had assured them formerly, calling them to their remembrance, saying, "My people, what have I done to thee? Have I not showered Judaism with wonders? Have I not raised the dead by only a word? Have I not healed every sickness and every weakness? With what, then, hast thou rewarded Me? And why forgetest thou Me? For healing, thou hast inflicted wounds upon Me; and for raising the dead, thou dost cause Me, the Benevolent, to die suspended upon a Tree as an evil-doer; the Giver of the Law, as a law-transgressor; and the King of all as One Who is condemned." (Stichera Verse, Tone 6, Ibid.) Because I led thee out through the desert forty years: and fed thee with manna, and brought thee into a land exceeding good, thou has prepared a Cross for thy Savior. What more ought I to have done for thee, that I have not done? I planted thee, indeed, My most beautiful vineyard: and thou has become exceeding bitter to Me: for in My thirst thou gavest Me vinegar to drink; and with a lance thou hast pierced the side of thy Savior. For thy sake I scourged Egypt with its firstborn: and thou didst deliver Me up to be scourged. I led thee out of Egypt having drowned Pharaoh in the Red Sea: and thou to the chief priests didst deliver Me. I opened the sea before thee: and thou with a spear didst open My side. I went before thee in a pillar of cloud: and thou didst lead Me to the judgment hall of Pilate. I fed thee with manna in the desert; and thou didst beat Me with blows and scourges. I gave thee the water of salvation from the rock to drink: and thou didst give Me gall and vinegar. For thy sake I struck the kings of the Canaanites: and thou didst strike My head with a reed. I gave thee a royal scepter: and thou didst give My head a crown of thorns. I exalted thee with great strength: and thou didst hang Me on the gibbet of the Cross. UPDATE: How could I forget: After Maundy Thursday, the Western Rite faithful keep vigil before the "tomb" containing the presanctified Eucharist (the "40 Hours Devotion"). On Good Friday, it is traditional for Byzantine Orthodox to keep vigil at the "tomb" of Christ. In both cases, it is to undo the disobedience of the sleep-ridden Apostles and arouse a sense of watchfulness. Also, on Good Friday in the West, during the Presanctified Liturgy (the only one of the year in the WR), the people recite the Trisagion...in Greek, no less. -- BJ. Again, at the risk of sounding like a broken record, "The Eastern and Western Rites are merely different ways of doing the same thing. "(TM) Though a certain school of Orthodox obscurantism rejects us, let's all humble ourselves, prostrate before whatever our particular Orthodox rite proffers, and meditate upon the life-giving Death necessitated by our numberless sins and transgressions - the truth so clearly driven home by both rites. And then let us embrace one another as fellow inheritors of that grace-bestowing Life. If we are to, in the words of the Paschal stichera, "call brothers even those that hate us," certainly we should do so for Orthodox brethren worshipping according to approved Rites of our Holy Mother the Church. Especially when we are praying the same things to the same Lord in the same Church. I meant to post this yesterday. Since we lie prostrate before the Cross on this Good Friday, I thought this post on the ancient history of prostrations' origins from Eric Jobe would be of interest. This sort of formula may be seen with various numbers indicating the number of prostrations the inferior is hypothetically performing such as "seven times seven" or the formula n+1, "seven times and eight." These prostrations are understood from Egyptian relief paintings and Akkadian letters to be prostrations not only on the belly but also the back...It is a form of obeisance that was observed over 3,500 years ago and still used today by Christians all over the world. Eric Jobe's scholarship is always appreciated. Let us all prostrate ourselves before the true Sovereign and Lord, ascending His Throne, the Cross of Glory, to free all mankind. It's Lent, so naturally, members of the Orthodox Church (particularly in the blogosphere) are discussing the topic of contraception. The Ochlophobist, in particular, has a series of well-balanced and pastorally wise posts on the subject (Pt. 1, 2, 3, 4, 5, and still going). Every Lent, there appears to be a divisive discussion of birth control, along with a major media assault on Christianity (the Grave of Christ, the Gospel of Judas, The Da Vinci Code, etc.). Both, as likely as not, stem from the same source. Ergo, I'm begging off the discussion at the moment. But the Ochlophobist is actually worth reading, thus far.